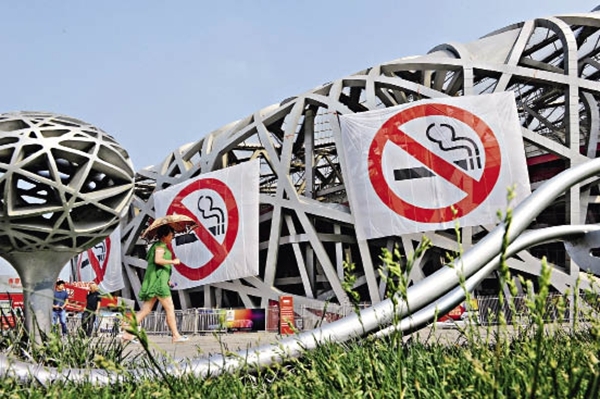 Beijing has collected about 2 million yuan (around 290,000 US dollars) in fines within 18 months since the city's smoking control drive first began, reports the Beijing News. A city-wide smoking ban in public places began in June, 2015, which includes all indoor public areas and workplaces, public transport, and a number of outdoor areas. The fine is up to 200 yuan for individuals and up to 10,000 yuan for owners of establishments that allow indoor smoking. As of November 30, 2016, 663 establishments and 2,719 individuals have been fined for violation of the smoking ban. As there are more indoor smoking cases in winter, authorities say smoke detectors and video cameras will be installed in places like restaurants, places of entertainment and workplaces to control smoking. The municipality will also give more support to smoking cessation clinics to help people quit the habit. Official data showed that in 2015 there were 4.19 million smokers in Beijing, accounting for 23.4 percent of the total population, which means more than 10 million people are being exposed to secondhand smoke, reports China Today.